Sportsmanship and class have always been an important part of Clemson Athletics. Two examples of Clemson and sportsmanship that come to mind happened this fall and another occurred over 60 years ago in the first year of the ACC–two events that Clemson fans can be proud of for generations to come. A few weeks ago at the 2016 Atlantic Coast Conference Women’s Cross Country Championships, a shining example of sportsmanship was displayed involving a Clemson runner and her counterpart from Boston College. After covering the grueling course, the Eagles’ Madeline Adams fell to the ground with exhaustion as she approached the finish line. It was evident she wouldn’t have the strength to finish the race. Clemson’s Evie Tate, with no regard about other runners passing her on the way to the finish line, stopped and helped Adams up and assisted her toward the finish line. Rachel Pearse of Louisville saw that Tate could use some help, so she got on the other side of Adams and the trio crossed the finish line together. Those that were there witnessed something you don’t see everyday. Over 60 years ago Clemson running back Don King brought notoriety to Clemson by winning the nationally renowned and prestigious Swede Nelson Award by a simple act of kindness and respect for an injured opponent. At the time, this was a coveted award that was presented by the Boston Touchdown Club and was given to the college football player who demonstrated sportsmanship during the year. To this day, it remains as one of the oldest awards in the nation given to a collegiate player. After Wake Forest’s Kenny Duckett won the award in 1981, it became a regional award and is only presented to players from the New England area. In 1953, winning this award was big news for the Clemson football program. On October 31, 1953, Clemson was playing Wake Forest in Tigertown. In the third quarter, Wake Forest had the ball at midfield trailing Clemson 12-0 when Demon Deacon quarterback Sonny George failed to get up after being tackled. Coaches, trainers and teammates surrounded George for at least 15 minutes. Ultimately, King left his Clemson teammates, who were waiting for action to resume, and went over to talk to the Wake Forest players and officials; then, George got up and resumed play. At the time, rules stated that if a player left the field because of injury he would have to sit out the remainder of the quarter, and Wake simply did not have a reliable substitution. “It was not until Monday morning when Tiger starting linemen Mark Kane and Clyde White stopped by my office that I found out what happened,” said Brent Breedin, Clemson’s Sports Information Director at the time. Kane and White explained that Don learned that George would be playing with an injured knee, so he told the rest of the team “when you tackle their quarterback Sonny George–tackle him high and not low, reminding us of his situation. King had knee injuries himself in several games the past two years. In addition to King demonstrating class and sportsmanship, he was an outstanding football player. Don King established a Clemson freshman single game rushing record in 1952 that still stands today. The native of Anderson, SC played for the Tigers and Head Coach Frank Howard from 1952-55 as a quarterback, and safety. On November 4, 1952 he rushed for 234 yards in a tie game at Fordham, the last time Clemson has played a football game in New York City. Fordham entered the game leading the nation in rushing defense. King played the tailback position in this game because of injuries to Clemson’s regular running backs. It was the only game King played tailback in his Clemson career. It is still the third most rushing yards in a single game by any Clemson back and a record for a Clemson player in a road game. 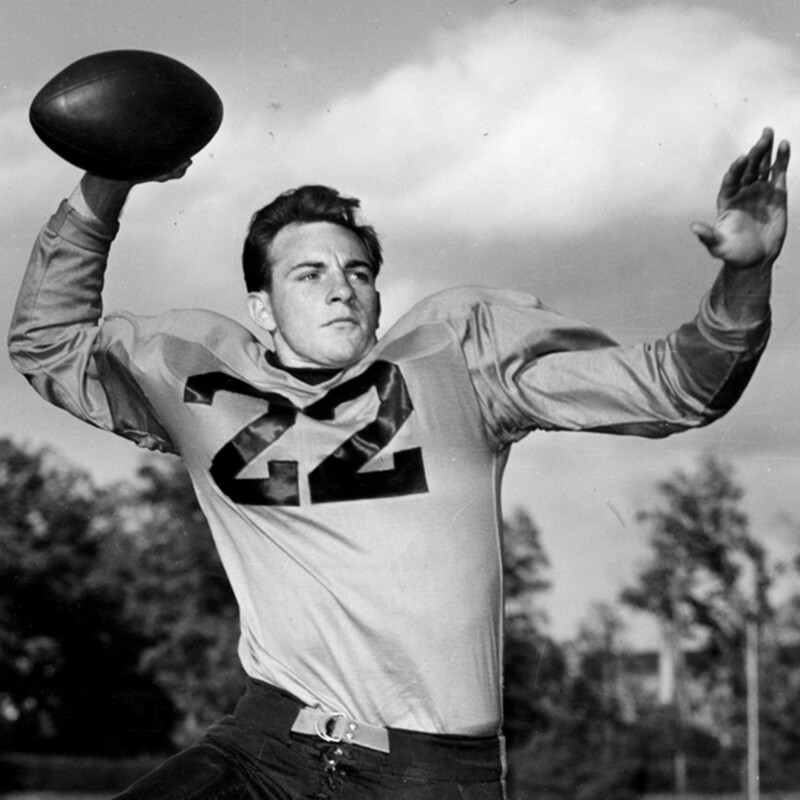 King led the Tigers in passing for four straight years and in rushing in 1953. He was the first Clemson player to lead the Tigers in passing four consecutive years. It is an accomplishment that has been equaled only by Nealon Greene (1994-97) and Charlie Whitehurst (2002-05) since. King passed away on February 14, 2013 at the age of 79. The 1992 Clemson Hall of Fame inductee was a second-team All-ACC quarterback in 1953 and 1954, his sophomore and junior seasons, respectively. This act of sportsmanship in the Wake Forest game that Halloween afternoon not only won King a prestigious, national award, but he also won the respect of his teammates, coaches, and foes and apparently the admiration of countless others.